I found some cool books and an intriguing CD at the library. 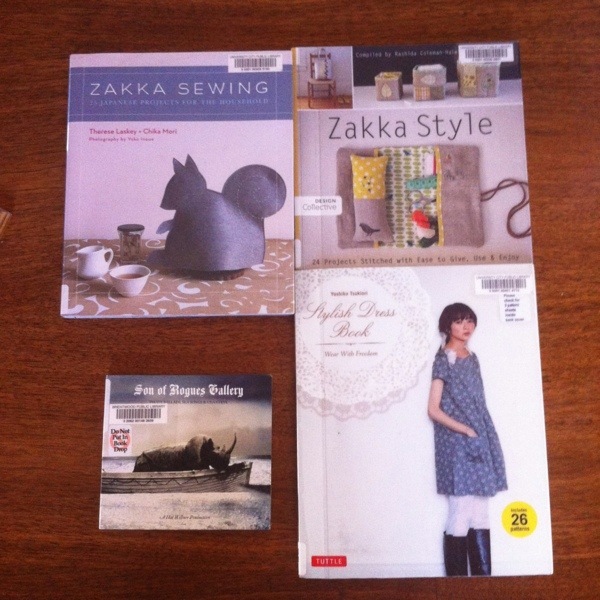 Zakka is a style I have only just heard of, I recognize it, but didn’t know it had a name and books! I am so inspired to bust out the sewing machine and make fabric into lovely stuff. The clothes book has some lovely versatile patterns in it. Clearly I am in need of a good fabric shop. Any recommendations? I am tempted to hit up a few in New York this weekend, but I fear I will not be able to contain myself! Guess where I am off today, I know- today! I am the perfectly hysterical mix of excited and nervous. My destination is Martha Stewart Living Omnimedia for the Alt Summit design blogging conference. I may well pop with inspiration and ideas by Friday morning! I will be posting photos on Instagram using the hash tag #catseatdogsnyc. My user is @catseatdogsmakes and you can use the link on this page to my Instagram too. Can’t wait to share my trip with you! Next PostNew York City almost made me pop.